Third-period goals from Auston Matthews and Kasperi Kapanen get Toronto a 2-1 victory, and the Maple Leafs are a win away from moving on. 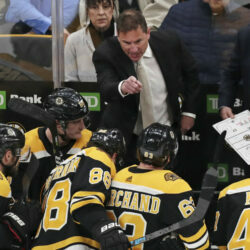 Coach Bruce Cassidy's decision to drop David Pastrnak to the second line – and then move him back up – was a key to Boston tying its series in Toronto. Toronto scores two quick goals in the third period, but fails to get the tying goal against Tuukka Rask in Game 4. Patrice Bergeron, Brad Marchand and David Pastrnak have not done enough and the Bruins behind Toronto because of it.